Seven-Course Malbec Gourmet Wine Pairing Dinner at Herrington Inn! Menu available and tickets on sale now, only $135 per person all-inclusive (seven courses, seven wines, tax and gratuity)! In addition, there will be surprise giveaways to all attendees and special incentives for case buyers. Capacity is capped at 50. Call (630) 232-8888 to reserve now. You don't want to miss this exceptional event! 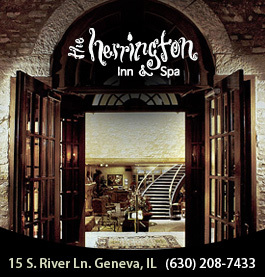 We are kicking off the holiday season in grand style, partnering with Geneva’s historic Herrington Inn & Spa to present a multi-course gourmet dinner prepared by Chef Kevin Gillespie served at the Herrington Inn’s spacious and luxurious full-service facility. Each course will be paired with either a red or a white wine from the Vina del Sol Argentinian portfolio. Trish Earley of Fine Vines will deliver an informative and entertaining presentation explaining the history of these properties, their vineyard management and winemaking techniques, the effect of terroir and vintage, and identifying the particular aromatic and flavor components that influenced each food/ wine pairing. A sampling of these wineswere featured at our sold-out Festival of the Vine V.I.P. Experience and were the hit of the weekend. They are perfect for celebrating the holidays with friends and family, gift-giving and versatile enough for every meal! Orders will be accepted on the night of the dinner, with special one-night-only discounts for attendees. Wines will be available for pickup at Geneva Wine Cellars the following week. Please direct all inquiries to Geneva Wine Cellars proprietor Al Buchanan via email, to al@genevawinecellars.com. Thursday, November 15 --- 6 - 10 p.m.